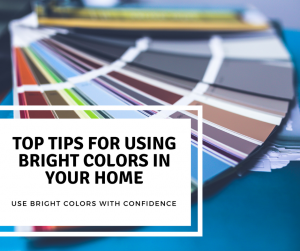 Are you afraid to incorporate bright colors into your home? Bright colors can be intimidating. They can easily clash with each other and it’s difficult to really know when and where to use them. Incorporating bright colors is a challenging step, but when done with care, it can bring new life into your home. The most important thing to understand when incorporating bright colors into your home is that colors interact. Different interactions bring out different characteristics in the color. Another way to think about this is that colors are dependant upon other colors. They compound in a sense, and when paired with one color versus another, they can look completely different. You really can’t describe any one color as a stand-alone and so the key is finding the best color interactions – the interactions that bring out the color characteristics that you like. A good way to study the relationships between different colors is by looking at a color wheel. Another strategy that will help you to keep your bright colors from clashing, is to maintain a cohesive level of vibrancy throughout each color. You can keep a vivid and fresh atmosphere by using a family of intense colors or go for a more calm and understated look with low-intensity colors. Regardless of your preferences, be sure to maintain a consistent hue throughout your house. Copyright © 2018 Colors By Design, LLC. All Rights Reserved.